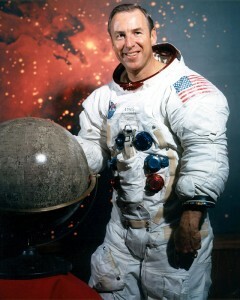 Full Name: James “Jim” Arthur Lovell, Jr. Note: The moon landing was aborted due to an explosion in the service module, the crew returned safely to Earth. Lovell would have been the 5th man to walk on the moon. Joined the US Navy following graduation, attended the US Naval Postgraduate School, completed test pilot training and served for 4 years as a Test Pilot at the US Naval Air Test Center at Patuxent River, Maryland. 1965, served as the Pilot of Gemini 7, a two week long duration mission to study the effects of prolonged weightlessness on the human body. 1966, Command Pilot of Gemini 12, the final mission in the Gemini program featuring over 5 hours of EVA by his crewmate Buzz Aldrin. 1968, CMP of Apollo 8 on mankinds first voyage to the moon completing 10 lunar orbits and photographing possible future landing sites. 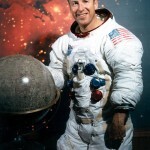 1970, CDR of Apollo 13, became the first man to enter space 4 times and to travel to the moon twice. Following the successful recovery of the aborted lunar landing mission, held the record for the longest time in space until the Skylab missions of the mid seventies. 1973, retired from NASA and the US Navy to join Bay-Houston Towing Co. in Houston, Texas becoming President and Chief Executive Officer in March 1975. 1975, became President of Fisk Telephone Systems in Houston. 1981, Group Vice-President, Business Communications Systems, Centel Corp., retiring as Executive Vice-President in 1991. 1994, Author of “Lost Moon: The Perilous Voyage of Apollo 13”. 1995, appeared in an uncredited role in the Ron Howard film “Apollo 13” as the Captain of the recovery ship seen shaking hands with Tom Hanks (who portrayed Lovell) after the successful recovery of the crew. Currently the owner and operator of “Lovell’s of Lake Forest”, a fine dining establishment in a suburb of Chicago, Illinois.